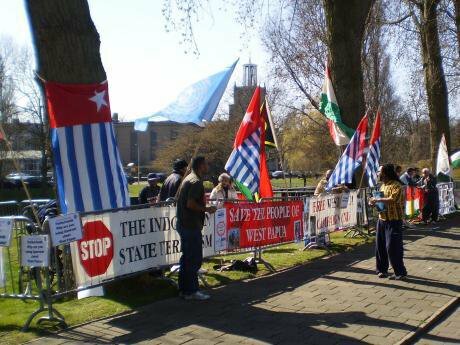 A demonstration by West Papuans in The Hague, against the Indonesian government. Wikipedia. Public domain. In guidebooks it is referred to as the country’s final frontier. It is a vast territory consisting of mostly unspoiled wilderness and a relatively sparse population. There are immense forests and soaring, glacier-capped mountains. When traveling to the region from the country’s populated core, it is common to see settlers and contractors who work for mining and logging companies. One cannot help but notice the presence of soldiers that are there to offer protection from the natives. This description sounds, to the American ear, like the development of the western frontier. It has an old world ring to it, and is resonant with the frontier stories of Australia, Canada, Russia, and numerous settings around the globe. But the subject of the description is West Papua, a contemporary frontier region in Indonesia. West Papua, roughly the size of California, is the colloquial name given to the western half of the island of New Guinea (the eastern half of the island is the sovereign state of Papua New Guinea). It is an extraordinarily diverse place with hundreds of languages and cultural groups. The very concept of West Papua is in many ways the product of colonialism. It was once known as Dutch New Guinea, a region within the Dutch East Indies. Between 1949 and 1963 it was a stand-alone Dutch colony. It was later called Irian Jaya after it came under Indonesian control in the 1960s. Since that time it has been the scene of an independence struggle against the Indonesian government. The independence effort, or Free Papua Movement, is now 60 years old. It is thought that 100,000 people have died in the resulting conflict, although estimates vary widely. Reports of torture, extrajudicial killing, and human rights abuses are common. The strategy of the secessionists (never really a unified group) has oscillated between outright insurgency – at times pitting rebels with bows and arrows against soldiers with modern weaponry – to forms of nonviolent civil resistance and protest to diplomatic outreach. Like other historical cultures on the frontier of a large expansive state, the West Papuans feel that they are becoming increasingly marginalized on their own land. A chief driver of this sentiment is the Indonesian transmigration program, an attempt by the state to relocate people from the core islands of Java, Bali, and Madura to the less populated and less developed outer islands. This has dramatically altered the population balance in West Papua. Whereas non-West Papuans accounted for approximately 4% of the population in 1971 and 32% in 2000, they are now becoming a majority. Whether or not this represents an attempt by the state to transform the ethnic composition of the region, instead of simply transferring citizens to less populated provinces, the native reaction is not hard to anticipate: they see this as a form of imperialism that alienates them from their land. Some observers of the state of affairs in West Papua have called it “slow motion genocide.” In addition to the demographic trends, the West Papuans feel marginalized from the economy and relative prosperity that non-West Papuans enjoy. West Papuans are disproportionately poorer and have higher rates of incarceration and alcoholism. The ethnic, linguistic, and religious differences combine with stereotypes of West Papuan backwardness to perpetuate forms of racism. Not unlike the marginalized indigenous groups of Australia and the United States, there is a seeming intractability to the divide that gives rise to despair. Many West Papuans fear that they will disappear as a people. Independence movements are shaped by their settings. The Northern Cypriots and the Abkhazians possess their own independent, albeit unrecognized, state and for them life is not so different from state-possessing nations elsewhere. The Catalans and the Scots have fully democratized movements and their resulting political efforts bear a likeness to other forms of formalized political contestation. But the conditions in West Papua are different. It is illegal to fly the independence flag (The Morning Star), demonstrations are routinely broken up, and independence-related meetings are often raided by the police or military. Media access to the region is limited. This type of state suppression transforms an independence movement in a specific way: it makes it into a resistance struggle. I recently traveled to West Papua to participate in a workshop focusing on unity building and the advancement of nonviolent methods for seeking self-determination. The workshop was clandestine and I was told to travel without any physical or electronic documents about secession should I be detained. The participants were brought in from all over West Papua and Indonesia, and included students, former insurgents and political prisoners, and members of the clergy. More than half of the participants had been beaten by the police, several had been tortured, and they all knew people who had been killed by the state security forces. At close range I have found all independence movements to be inspirational. There is always a sense of hope, enthusiasm for the mission, and a poignant celebration of national identity and culture. But independence movements in the form of a resistance struggle are truly stirring, and I was unprepared for the level of camaraderie and devotion I found when attending the workshop. The participants would begin each session by joining hands and singing spirituals. They engaged in highly emotional unity-building exercises and forms of ritual. In one exercise they formed a circle, joined hands, closed their eyes, and took turns calling the names of those who have inspired them, alive or dead. With each calling the group would murmur “present” (in Indonesian). I was told that this was a way to invite the larger community (the living and the dead) to bear witness to their struggle, and that the practice was borrowed from past Latin American resistance groups. A visitor to Barcelona will quickly notice the ubiquity of the Catalan independence flag. But in West Papua I saw the Morning Star flag only once, painted on the side of a handbag for sale at a local market. I asked a friend if the vendor would be arrested, and they replied that the West Papuans push the envelope in small, subtle ways such as this – after all, it was a bag not a flag – and that such acts constitute everyday forms of resistance. The deck is stacked against the West Papuans. Indonesia is quite keen to hold on to the province, and it is a strong state with powerful allies including the United States, Australia, and transnational mining corporations, who all have an interest in looking the other way. The military and police are involved in local business and the growing non-West Papuan population is loyal to the state. Secessionist-related activity is punishable by imprisonment or worse. And the West Papuans are becoming increasingly marginalized. This is a form of frontier imperialism that goes largely overlooked outside of West Papua. Yet this is a moment that took place generations ago on other frontiers. Given the current trajectory, the West Papuans are destined to become a small minority in their own land. Like the Native Americans or Australian aboriginals, their languages might endure in pockets and in the names of geographic features and terms that will be appropriated by the settler population. One day, after a period of semi-assimilation, forced or otherwise, there may even be sincere society-wide attempts at reconciliation that many will see as too late. There are two sides to every independence struggle. The Indonesian government has gotten some things right and it would be wrong to fault the non-West Papuan migrants who are just seeking a better life. But there is always space for dialogue, the right to free speech, and the opening of democratic channels. The solution is to empower the West Papuans now, to recognize and bear witness to their struggle, and to give them greater autonomy, before it is too late.